Mahabalipuram and its iconic Shore Temple has been the subject of research and scholarship and countless publications for hundreds of years. One might ask, could there be anything left to discover? Sometimes the greatest mysteries are too obvious to be seen. Hidden in plain sight, as it were. During my latest visit my eye fell on one such ‘unseen’ and unrealised mystery. 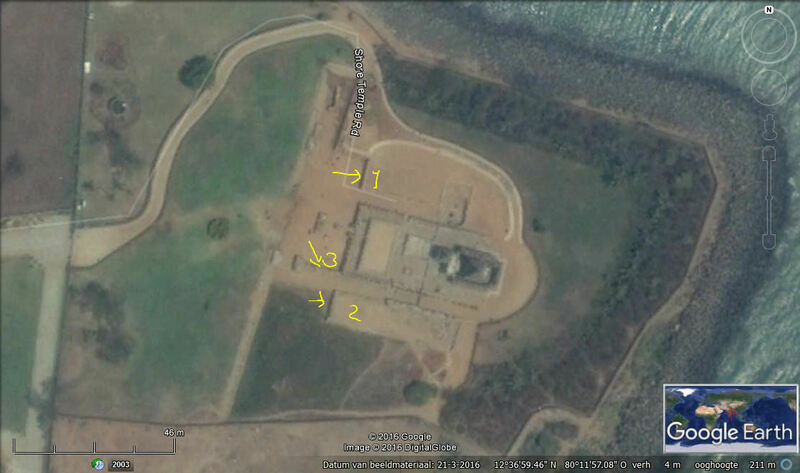 Maybe because of being exposed to the anomalous technology found around the Gizeh Plateau and its Pyramids in Egypt. And the fruitful collaboration with Patricia Awyan and the Khemit School of Ancient Mysticism. 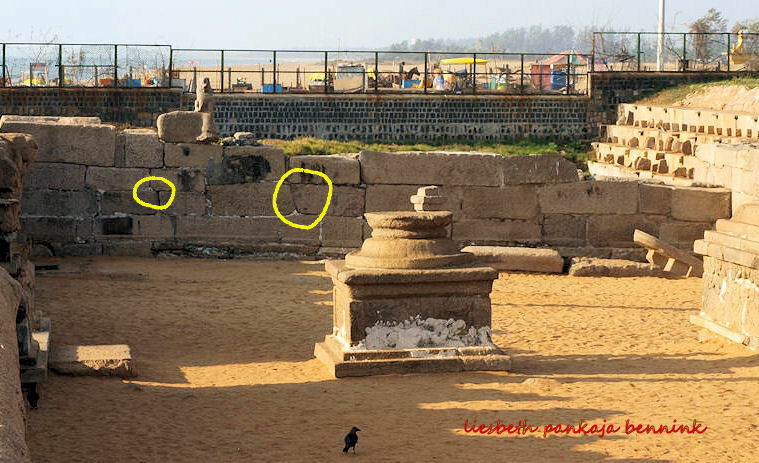 I realised some wall sections around the Shore Temple didn’t fit in with well known medieval South Indian temple architecture. The character, size and shape of the stones, the structure of the walls, all point to these walls being of a different make-up and age. 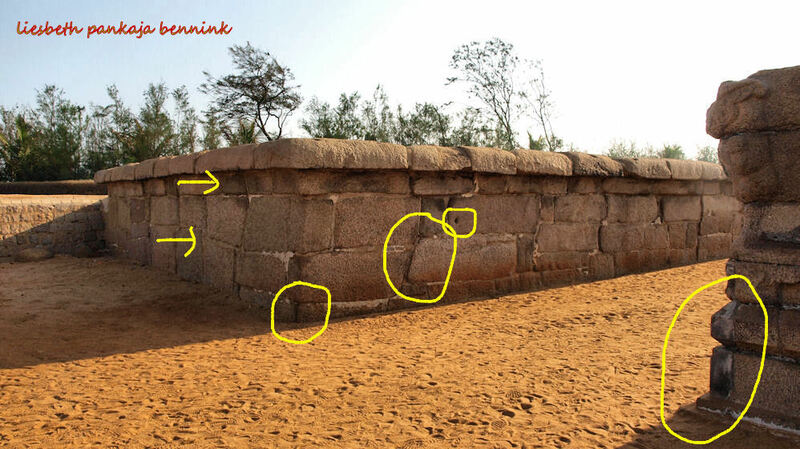 These wall sections and structures can be understood as megalithic. 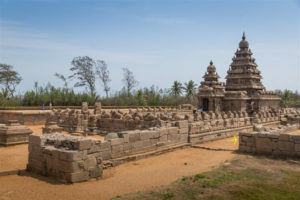 Mahabalipuram was known as The Seven Pagodas in the early maps and descriptions of the Bay of Bengal for Western sailors. Its legend of the grand city swallowed by the waves has attracted scholarly interest from the 18th century onwards. Today it is a Unesco World Heritage site visited by millions of tourists. Still it is largely an enigma. 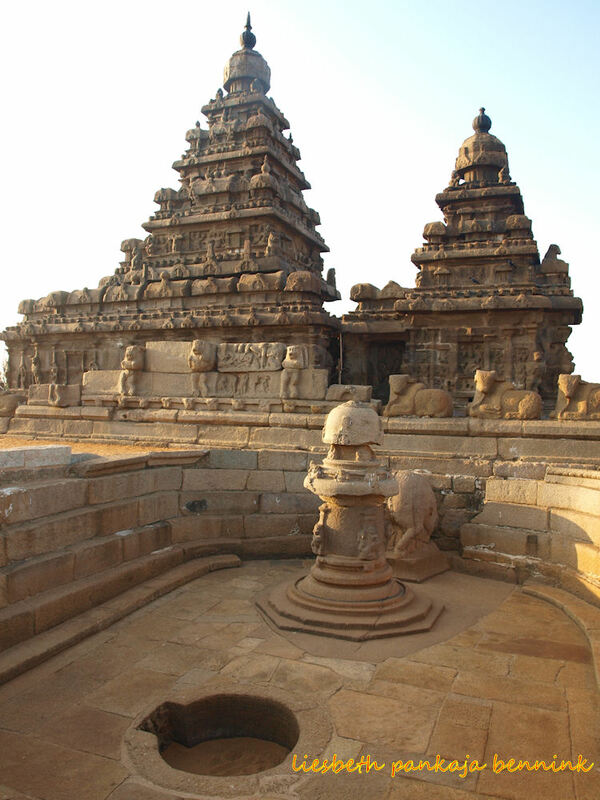 Its conception is credited to kings from the Pallava dynasty of the 6th and 7th century CE. Covering several square kilometres it consists of various groups of monuments scattered on and around a low granite hillock. Mostly monoliths and excavated cave shrines. With a few structural temples. 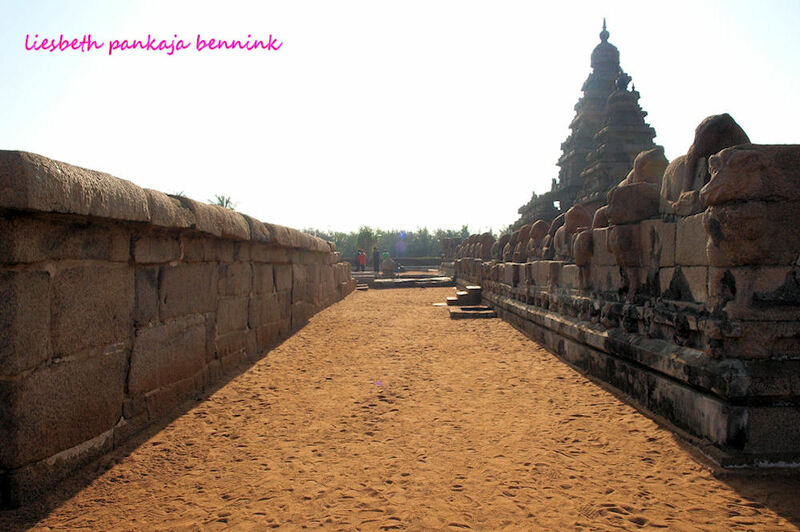 The most iconic is without doubt the Shore Temple with its double spires. Its silhouette is almost a signature for Indian culture. Mysteries abound here. Very little is known except for a few inscriptions that leave scholars arguing. The monuments are for the most part unfinished. These monolithic structures and caves are anomalous and stand out from general architecture. While at the same time also reflecting known temple architecture. Legend and the witnesses of the local fishermen speak of a series of five submerged temples stretching more than a mile into the sea. Early travellers like Jacob Haafner also describe these submerged structures as a danger for shipping. It is thought the name of The Seven Pagodas referred to this. These megalithic walls belong to two rectangular structures to the North and South of the enclosure wall of the temple proper. 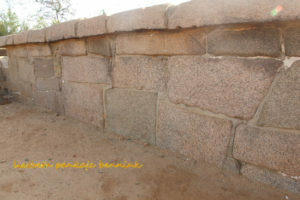 And to a stretch of wall that continues from the southern enclosure wall of the temple to a kind of gate structure. 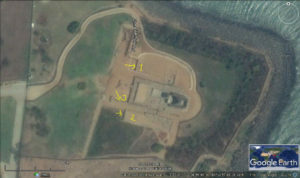 The two rectangular structures are situated symmetrically on the Northand South flank of the temple. 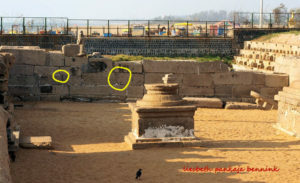 As both walls can be expected to be founded deeper than the temple it could be concluded these structures may be older than the temple itself. these very interesting structures have been left as they were for centuries. Unseen and ignored. Temple walls usually don’t attract much attention, unless they carry inscriptions. Having been on several field trips with Patricia Awyan of the Khemit School of Ancient Mysticism, who specialises in Ancient Egypt, has awakened my awareness to megalithic structures and anomalous technology. I have seen countless temple walls. 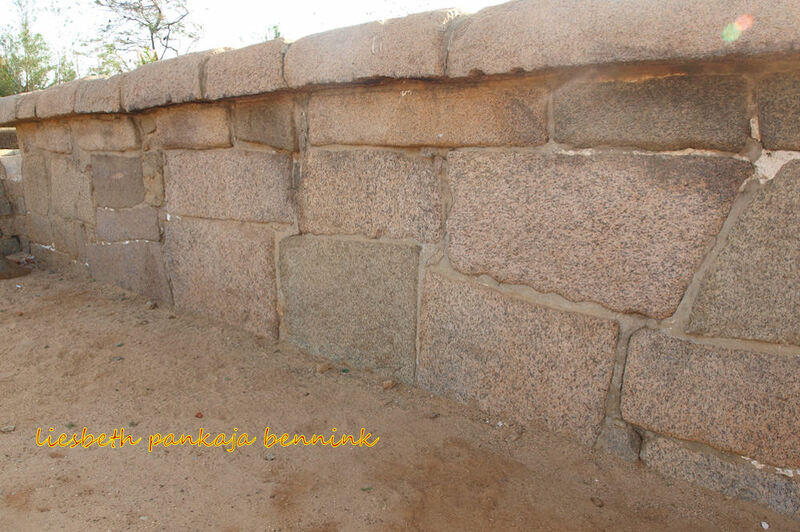 I had not seen any other megalithic type walls in India so far, as far as my memory goes. These walls show the megalithic remains described by Graham Hancock connected to megalithic remains on dry land. It may also tie in with what was probably the earliest deity worshipped in this temple, the Vishnu Jalasayana, Vishnu Resting on the Waters. 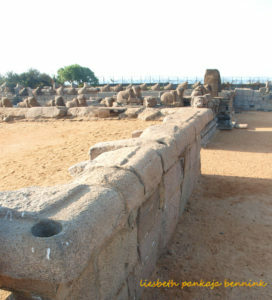 Scholarship holds that the Vishnu, carved from the bedrock, was worshipped here before the two Shiva shrines with their iconic spires were added by the Pallava king. How did they carve these perfectly round holes in the hard granite? And why? The iconic Shore Temple of Mahabalipuram has not yet given up all its secrets. Are these megalithic walls connected to the ancient city that was drowned in the sea? Hopefully future archaeological research will find out the answers. Very interesting point taken to discuss. Please also write for our Journal STHAPATYAM (Journal of the Indian Science of Architecture). you may visit its Facebook and website also. Thank you for the invitation. It would be an honour!